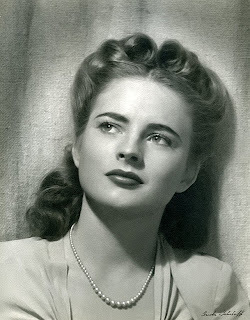 Actress Coleen Gray, the star of many film noir and Western titles, turns 90 today. Gray was born in Nebraska on October 23, 1922. I'm a very great admirer of Gray's performance in KISS OF DEATH (1947), her first major movie release, filmed when she was 24. Although Richard Widmark understandably received great attention for his electric, Oscar-nominated film debut as gangster Tommy Udo, the movie wouldn't work as well as it does without the contrast of the sincere, heartfelt performances by Gray and Victor Mature. Gray and Mature's work has been underrated by some, but I would go so far as to say they provide two of my all-time favorite screen performances. As I wrote at the time I first saw KISS OF DEATH, Gray's natural, emotionally open performance is quite different from other acting of the era and almost has a modern feel to it. The only thing I can compare it to from that time frame is Deanna Durbin's unusual screen personality; I've never seen anyone else on screen quite like Durbin or quite like Gray in KISS OF DEATH. 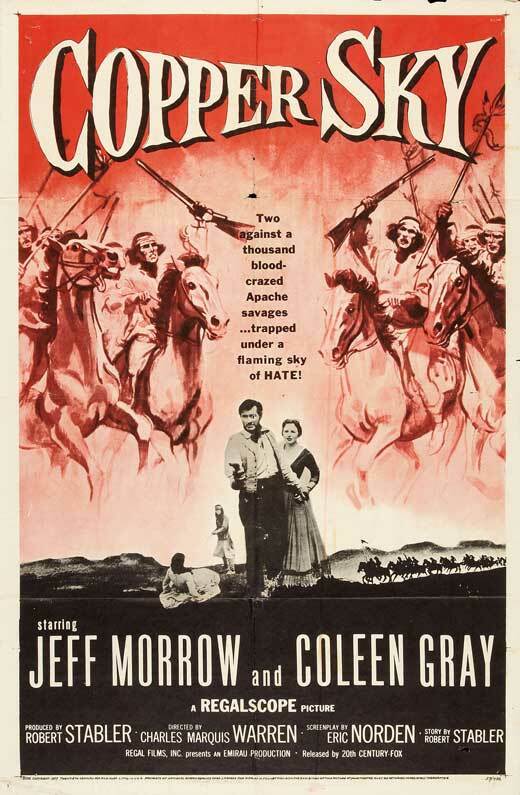 I was also very taken with COPPER SKY (1957), a "B" Western variation on THE AFRICAN QUEEN, with Gray struggling to survive the desert and Indians along with hard-drinking cowboy Jeff Morrow. 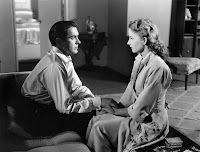 Gray's glowing performance is again refreshingly natural, with an especially lovely scene where she and Morrow pray together. I was particularly struck by the moment after Morrow kisses her, when she turns toward the camera with a look of pure, unfettered joy on her face. It was another of those special, unique scenes from her career which has stayed with me. The quality of Gray's films was somewhat variable, as was the impact she made on film. Some movies didn't seem to know quite what to do with her, and she thus doesn't come off as well playing unpleasant or underwritten characters in titles such as SABRE JET (1953) or TENNESSEE'S PARTNER (1955). With the right director and script, however, Gray's work was transcendent and unforgettable. Her classic films included RED RIVER (1948), which was filmed early in her career but released after KISS OF DEATH, and great noir titles such as NIGHTMARE ALLEY (1947), KANSAS CITY CONFIDENTIAL (1952), and THE KILLING (1956). It's interesting that some of her best-known films today didn't receive much of their critical recognition until years after they were released. THE SLEEPING CITY (1950) was another excellent noir title, costarring Richard Conte, although I had a sneaking feeling a little too much of her performance was left on the cutting-room floor. 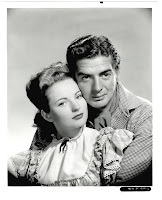 Gray appeared in many Westerns over the years, including FURY AT FURNACE CREEK (1948) which reunited her with Victor Mature of KISS OF DEATH. Other Gray Westerns I've seen include ARROW IN THE DUST (1954), costarring Sterling Hayden, and the low-budget THE WILD DAKOTAS (1956) with Bill Williams. I've also seen Gray opposite William Holden in the family comedy FATHER IS A BACHELOR (1950), and I look forward to seeing many more of her movies for the first time, such as a Western produced by Val Lewton, APACHE DRUMS (1951). There's an interesting interview with Gray available on YouTube, divided into chapters on Henry Hathaway, Tyrone Power, Sterling Hayden, NIGHTMARE ALLEY, Howard Hawks, RED RIVER, Stanley Kubrick, and more. Fans should be sure to check it out. Sending happiest wishes, as well as gratitude for many wonderful movie memories, to a very special actress! Update: A Visit With Coleen Gray. 2013 Update: Here are links to reviews of more Coleen Gray films: NIGHTMARE ALLEY (1947), APACHE DRUMS (1951), THE FAKE (1953), and THE KILLING (1956). Coleen Gray appeared in person at the screening of THE KILLING at the TCM Classic Film Festival. Update: Here's a review of the ARROW IN THE DUST (1954) DVD, and a look at Gray in the engaging LAS VEGAS SHAKEDOWN (1955) with Dennis O'Keefe. October 2013 Update: Here's a link to a profile I wrote of Gray which was just published at the ClassicFlix site. April 2014 Update: Here's an account of the memorial service for producer Stanley Rubin, where Coleen Gray was a eulogist. August 4, 2015 Update: Farewell to Coleen Gray. I agree, Coleen Gray is a lovely, underrated actress, who didn't seem to get the breaks after Kiss of Death and Nightmare Alley. It could be that quality of naturalness you noted - she's not visibly 'acting' onscreen, she's just being the character. She made an interesting horror film in 1960 called 'The Leech Woman' (on dvd), which is worth watching for its ahead-of-its-time feminist slant, as well as for Gray's performance - she plays a 'bad' girl here, unusual in her career (though when you see the film, you entirely sympathize with her!). I talked to Coleen today and wished her a happy birthday. I will share your lovely post with her next week. I'm sure she will be delighted! Thanks so much for your comment, Grand Old Movies, I'm delighted to hear from someone else who appreciates Coleen Gray's work. THE LEECH WOMAN sounds like fun! This is a great post, Laura. It's a real shame she hasn't received the credit she deserves — so many terrific movies. She has a way of elevating a film just by showing up. Leech Woman is a good example. Thanks to your enthusiasm for it, I'm dying to see Copper Sky. It's turned out to be one of those pictures I can't seem to track down no matter how hard I try.